Yes, of course, there are gold farmers in China. But why? As stated in my review, Author Cory Doctorow's upcoming book For the Win does a fantastic job of putting a human face on China's online gaming gold farmers. Read the review for more. Obviously, the "gold" here is virtual in-game currency! And the "gold farming" is a amassing in world currency for resell. "Gold farming is focused in China because moving gold between servers is difficult," Doctorow tells Kotaku. This, of course, is not the sole reason. To make a transaction it is necessary to move gold or items between servers, and it is also necessary to have players in all versions of the game. Many of the Chinese gold farming networks are so expansive that they are able to do this. According to Doctorow, gold farming is viewed as somewhat of a get rich quick scheme. 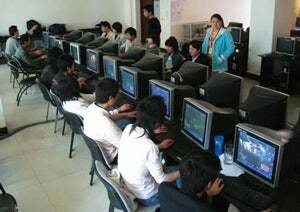 The idea of getting ten gamers in a room and having them play through some MMO gives the illusion of fast and easy cash. A lot of these fly-by-night, start-up gold farms don't make it as business acumen and an expansive network (see above) is needed to make the enterprise work. Doctorow notes that in 2008, many gold farms were being set up in rural parts of China, because all that is needed are computers and an internet connection. One reason online game companies have players play on different servers is to cutdown on things like gold farming; however, Doctorow points out that game companies, in a way, do need gold farming. Over time the game gets harder and harder in order to challenge experienced players. The example Doctorow gives is that, say, a wife has been playing a game for two years. Her noob husband wouldn't be able to play with her per se. That's where gold farming comes in. It allows new players to have the purchasing power to catch up quickly. So gold farming, says Doctorow, in a way balances out the game. This might be a reason why game companies crack down on gold farmers, but not those who buy gold or in-game items. And even though China has been outsourcing gold farming to Vietnam, the gold farming networks have become so entrenched that the Vietnamese would still have to go through Chinese brokers if they decided to set up their own gold farms, underscoring the power they wield in the virtual economies.